WE PROVIDE 3 YEARS WARRANTY. 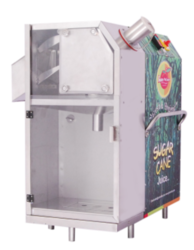 When someone is looking for a Sugarcane Juicer Machine, the most important decision is to find a manufacturer who does not only produce the machines but has also spent considerable time to research and practically refine the product. Over the years this is what Popular Steel Industries has exactly done & come up with a Sugarcane Juice Extractor Machine which takes into account all the practical needs of anyone planning to install a Sugarcane Juice Machine. 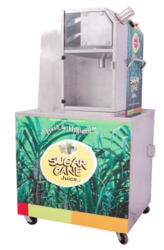 Juice n Juice Sugarcane Juice Machine machine are sturdy field proven and easy to operate machine. The Model SGT-1 machine is Table top, compact by highly effective model. It can crush 1kg cane per minute. For operating this machine, no skill is required to extract the juice. Anyone can extract juice, without spoiling the cloths in front of customer. Net Weight : 108KG, Gross weights 160kg Approx.